The LOMID project partner CEA-LETI in Grenoble have recently been able to show that the microdisplay thinning technology they developed within the project, allows us to fabricate fully functional curved high resolution OLED/CMOS microdisplays. 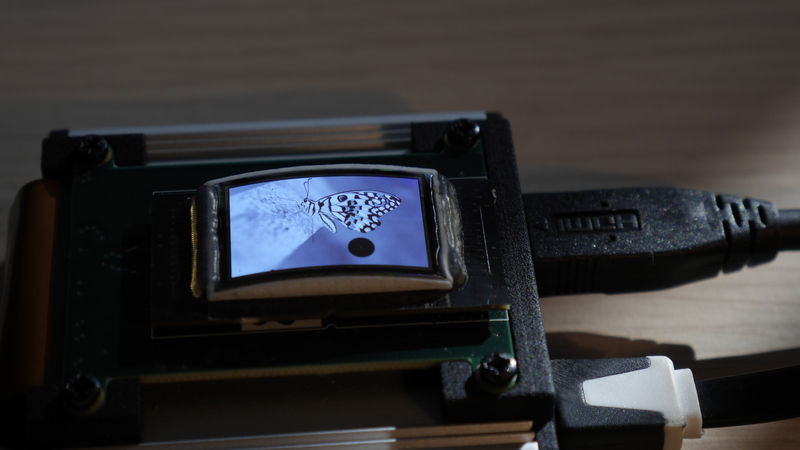 The image shows one of the new 1″ WUXGA LOMID displays in operation, bent with a radius of curvature of 45 mm. Careful inspection shows a few circular defects in the image, believed to be due to particle contamination during assembly of the display (this process is not yet fully automated). The ability to manufacture curved microdisplays will give optical designers one more ‘degree of freedom’, allowing e.g. future head-mounted displays to be more compact or lighter, wihtout sacrificing performance.